Salvation And Survival: What's Up With The Ring Of Fire? Are We Paying Attention? What's Up With The Ring Of Fire? Are We Paying Attention? It's always interesting to see how the public reacts when a scientific-style article comes out on natural disasters. The latest concern of both the U.S. Geological Survey and the average citizen, is the increased activity along the area of the Pacific Ocean, known as the "Ring of Fire". 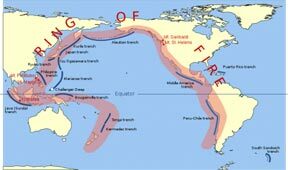 In case you're unfamiliar with that term, here is how Wikipedia defines it: "The Ring of Fire is an area where a large number of earthquakes and volcanic eruptions occur in the basin of the Pacific Ocean. In a 40,000 km (25,000 mi) horseshoe shape, it is associated with a nearly continuous series of oceanic trenches, volcanic arcs, and volcanic belts and/or plate movements. It has 452 volcanoes and is home to over 75% of the world’s active and dormant volcanoes." Didn't know it existed? I did, but don't usually think too much about it --- until I start seeing a proliferation of articles on it and a rise in concern over its activity. A website called The Truth reports that during late 2013, ten major volcanoes erupted along the Ring of Fire, and while the mainstream media in the United States was strangely silent about this event, it was a very big deal. They say that during that time period, scientists saw eruptions at some volcanoes that have been dormant for decades. Volcano creates new island off the coast of Japan. A dramatic volcanic eruption in the Pacific Ocean has created a tiny new islet in Japan’s territorial waters, the first time in decades the nation has seen the phenomenon. Mount Sinabung in Indonesia. During that same time period, a volcano in western Indonesia erupted eight times in just a few hours, “raining down rocks” over a large area and forcing thousands to flee their homes. But it wasn't just the Far East that experienced a higher rate of activity. A series of eruptions occurred in Mexico, Guatamala, and the Kamchatka Peninsula in Russia. And do you see that the West Coast of the U.S. lies between those pinpoints on the map? Alright, so maybe we didn't see anything to report about back in the fall of 2013... but does the same hold true today? What's the latest on the Ring of Fire? According to the latest U.S. Geological Survey updates, A total of 583 small earthquakes have shaken San Ramon, California, in the last three weeks or so – more than five times the record set 12 years ago. Could this be the prelude to "The Big One" that everyone in California is waiting for? Everyone knows that a major earthquake and/or tsunami off the coast of California, or in Alaska, may well be enough to destroy everything in its path. And is the American public prepared for such an event? An estimated 750,000 people would need to be evacuated from Los Angeles alone, with comparable numbers in other large metropolitan areas, according to experts. Even a relatively mild event could be sobering. It's been over a year since a 6.0 earthquake rocked the Napa Valley in California; and over 20 years since the 6.7 quake in Northridge, California. Have Californians, and Americans in general, become lulled to sleep? The truth of the matter is that California hasn’t dealt with a serious tsunami wave or earthquake in the recent and short memory of the public, and hence the general population remains clueless on what to do. Most will follow instinct and head for higher ground or flee the city, but are the highways and routes capable of facilitating a quick exodus from the most danger-prone areas? Let's face it, for years, we have watched as the rest of the Ring of Fire has been absolutely ravaged by major seismic events. We all remember the earthquakes that caused the Indonesian tsunami of 2004 and the Japanese tsunami of 2011. And the world mourned when major earthquakes devastated New Zealand, Chile, Peru, Japan and the Philippines. Don't you think it is only a matter of time before the San Andreas fault is affected by whatever appears to be happening to the earth's crust? I don't want to come off as "doom and gloom", but I think it is time to begin paying attention to the signs that the earth is giving us. Huge, unexplainable sinkholes; rumblings and strange noises coming from deep inside the earth; and an increase in activity along the Ring of Fire are nothing to ignore or blow off. I just think it is prudent to be prayed up and prepped up for what my spirit is telling me could be a major event in our near future. Yes, the Lord is in control, but He gave us a brain and an innate instinct to survive. Are you listening to that instinct? Revelation 16:18 "And there were flashes of lightning and loud rumblings and peals of thunder; and there was a massive earthquake—nothing like it has ever occurred since mankind originated on the earth, so severe and far-reaching was that earthquake."